One of the few obligations for foreigners living in this country, right up there with paying our bar tabs, is to visit Immigration every three months to tell them where we are living. This is the Thai government’s way of keeping tabs on its “guests”, many of whom come from countries who are glad to be rid of them for awhile. It’s not a cumbersome affair; you simply go in, fill out a short address form, then hand it and your passport over to a clerk to process. I’ve never had any real trouble, at least until now. It all arose from the Immigration Bureau having been relocated to temporary offices because of the protests here in Bangkok, which closed many government facilities. 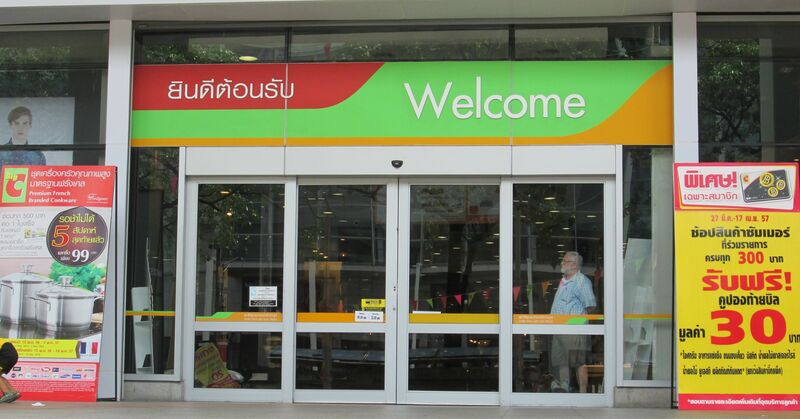 One of the new locations was in the Big C Super Center Mall on Ladprao Road. A printed map from the Bureau’s website provided what appeared to be simple directions for getting to the mall from the Ladprao Subway Station. But once I arrived there to begin my quest, the map did not agree with the local one posted near the ticket machines. One was telling me to go right on Ladprao Road, the other left. Deciding to trust Immigration’s directions, I turned right as I exited the station. Within twenty minutes my efforts were apparently rewarded as I stumbled upon a Big C Supercenter. 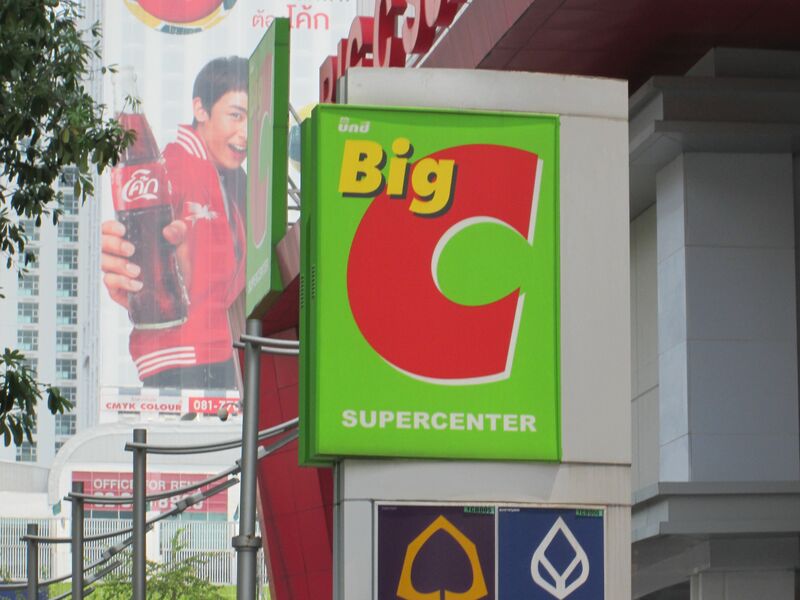 Oops, wrong Big C Supercenter. I should have turned left on Ladprao. This meant I had to return to my starting point, then begin a new hike. And the day was growing uncomfortably hot. Most people in this situation would have thrown in the towel and hailed a cab. I, however, have had a number of less-than-satisfactory experiences with Bangkok taxis and prefer to get around on my own whenever possible. Besides, the Immigration map seemed to indicate I only had about an eight-to-ten-block walk beyond the subway station. Or maybe not. Some forty-five minutes later, with my breathing hot and labored and my pace slowed to a near-crawl, it began to dawn on me that the stupid map was not drawn to scale and what I had assumed was a moderate stroll was in fact a death march for anyone foolhardy enough to attempt it. (5 kilometers, or over 3 miles, when I looked it up later.) Surrendering to the inevitable, I stepped off the curb and flagged down a taxi. This should have marked the end of my sufferings. The driver seemed to understand that my desired destination was the Big C Mall on Ladprao 81 (I’d figured out the address by now) and within ten minutes we were turning into the main entrance. But then the guy kept going, all the way down the right side of the huge complex, then out onto a small side street, leaving the mall behind. Heaven knows where he thought I wanted to go. I finally got the cab to stop, paid the fare, then slammed the door extra hard before trudging back. It was a blessing that things went smoothly at Immigration. It had taken me a good three hours to get there — in no small part due to their goofy map — and I was sweaty, worn out and in a very bad mood. If I’d had to deal with some overly officious clerk, they would have needed at least two security guards to pry my hands from her throat. Yet one final frustration remained. After I’d finished the paperwork, navigated my way out of the mall and summoned another cab to take me home, the driver refused, saying it was too far back to the center of the city. Realizing that the next taxi operator who disappointed me might not live to tell about it, I elected to ride a city bus — for the first time — back to Ladprao Station where, after initially getting on a train going in the wrong direction, I eventually made it back to my apartment. It felt like I had run the Boston Marathon. Thank heavens I only have to do this every three months. This entry was posted in 2014, 2014: Mar---Apr and tagged Bangkok. Bookmark the permalink.